Yapchat is a webcam chat site which offers a chatroom for their users. You don’t need to register to site for begin to chat. But if you want take a stable nick on this site, you can still register, if you don’t want you can login to webcam chat room as a guest. It’s not required to have a webcam for enter Yapchat. So you can enter to site without a webcam. But if you want to show something in your webcam view and if you want to use fake webcam program for that. You can stil use it. Fake webcam programs are not forbidden in the site. However you shouldn’t publish illegal stuffs in your webcam. Yapchat is in English language and people are generally speaking English in the channel. You can still send private messages to users in webcam chat. However if you don’t know English very well, it will be hard for you to communicate with people. 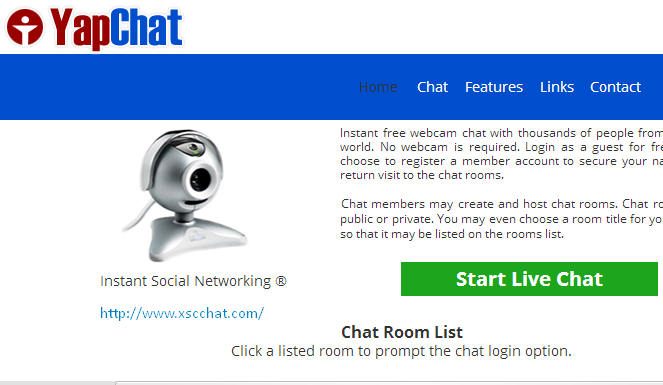 You are going to find many USA users in this webcam chat room. There are also people from middle east and asia.